Like all people whose lives revolved around farming, the ancient Maya were completely at one with nature. 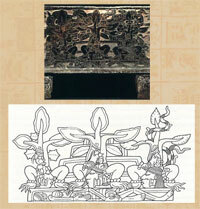 Every kind of tree, plant, leaf, flower, fruit and root featured in their symbols. Above all, their crops, that fed and gave them wealth, enjoyed a special place in their religion and in their ancient myths. 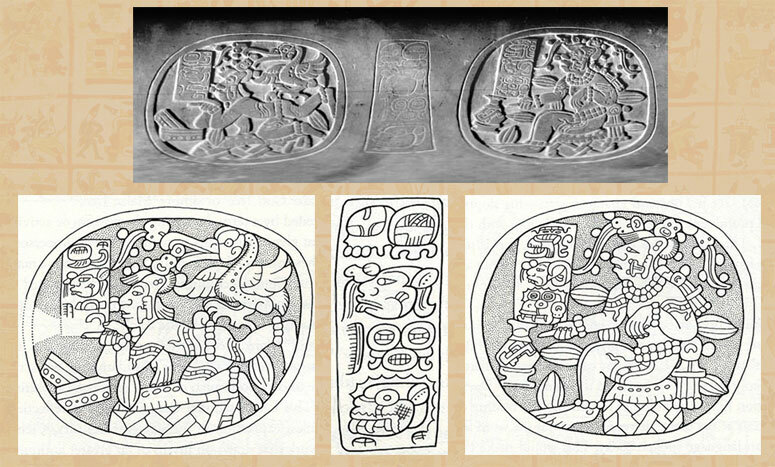 We start by looking closely at the images on a small stone Maya bowl, now housed in Washington, USA. 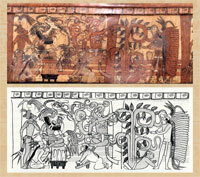 The two surviving scenes show a man-like figure sitting or lying on a seat covered with a mat (pic 2). 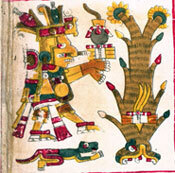 His arms and legs are studded with ripe cacao pods, and his skin is decorated with wavy ‘wood’ motifs. By all accounts we’re looking at a cacao tree in human form. In the scene on the left he examines an open book, while on the right he points to what may be a chocolate pot. Experts have dubbed this young lord a ‘Cacao God’. Strangely, though, his features – sloping brow, hair cut and styled in certain parts, jeweled forehead – ally him with the Maize God. 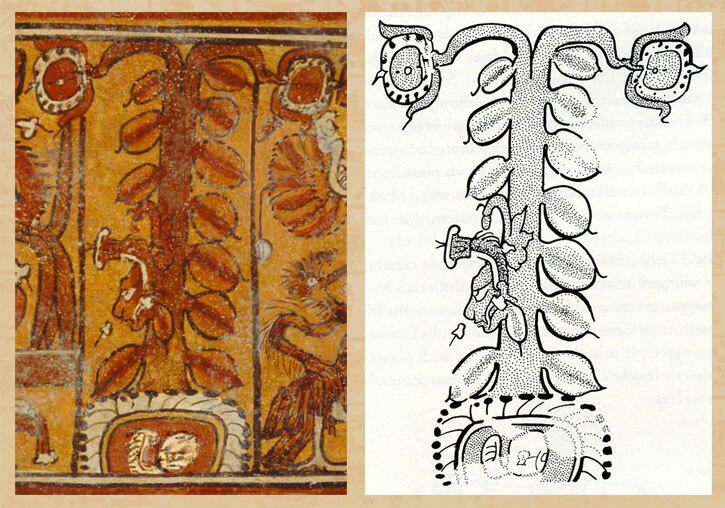 So underneath his chocolate coating he appears to be the old Maize God who has taken on the form of a cacao tree; and the accompanying text (centre) confirms this, calling the figure the ‘Maize Tree’. 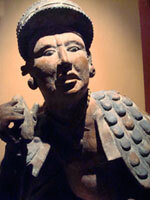 In ancient Mexico maize had a sacred spirit, which had to leave the corn cob before the crop could be harvested. For ancient Mexicans not only humans have souls, but every living thing (and this extended to natural elements such as stone and water); what’s more, we’re blessed with several spirits or life-forces, each with a different destination after death. 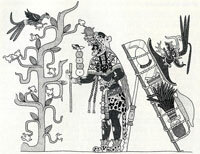 Death itself, far from being the end, is crucial to provide nourishment for new life (when something decomposes it provides compost and food for new things to grow), and the scene on the Berlin vase shows the journey of the Maize God’s soul as it goes forth to nourish and join forces, eventually, with the sun. Because cacao was considered so valuable in ancient Mexico, the Maya portrayed it as the first among the fruit trees grown from the Maize God’s abandoned body. But as we’ve seen, it certainly wasn’t the only one: the ‘death’ of the Maize God gave life not just to cacao or to maize but to ALL life-giving food plants. It was the very symbol of fertility and plenty. 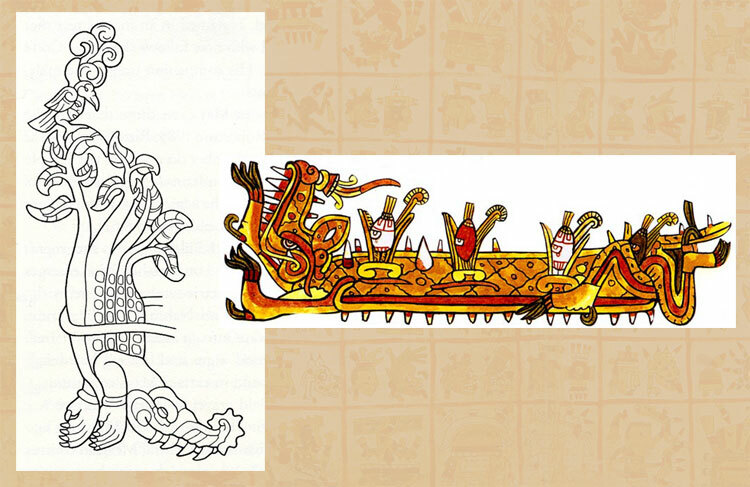 For ancient Mexicans, human beings were formed out of corn dough, and the eternal life cycle of the Maize God just ‘recycles’ the material from which all people are made. Youngsters, then and now, were called ‘sprouts’. Rather than going off to some heavenly paradise after death, the Maya in particular believed more in the old and dying being reincarnated as grandchildren. 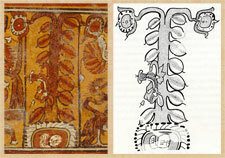 In the Popol Vuh the sacred maize tree – under as well as above the ground – produces divine fruit (cacao) which is in itself the seed for future generations. 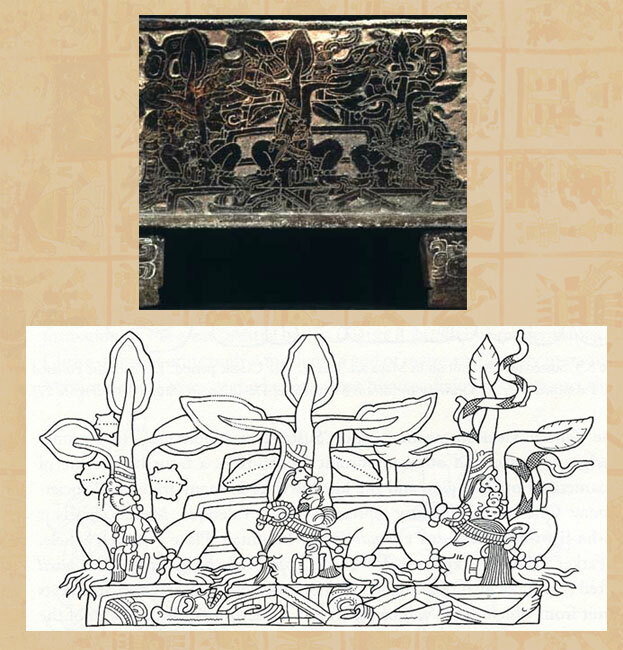 Indeed ALL fruits are symbolic heads of the Maize God, and often in Maya art we find cacao pods shown as human faces (pic 6) (it’s interesting that in many Maya languages the word for ‘fruit’ sounds exactly the same as the word for ‘face’). 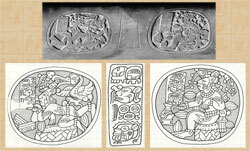 In Maya belief the centre of the world is a large tropical ceiba tree, connecting heavens and earth – the ‘first’ tree, a World Tree, the Maya version of the Aztec cipactli, a supernatural crocodile representing the surface of the earth, out of which plants and trees grow (cipactli was also the first of the twenty Aztec calendar signs). (Why associate crocodiles with trees – remember the diving figures we met earlier? – well think how similar-looking tree bark and crocodile skin is, and picture a half-submerged croc: it looks very much like a floating log...) At the four corners/directions/limits of the earth and cosmos stand four more trees, each a different special colour; all five combine as pillars to support the skies in a classic shape (4 corners + 1 in the middle) called a quincunx, central to ancient Mexican views of the universe and commonly found in nature. ...and in the murals of Cacaxtla (pic 9) showing God L as a trader, with his merchant’s pack (topped with his unique broad hat) and a cacao tree. 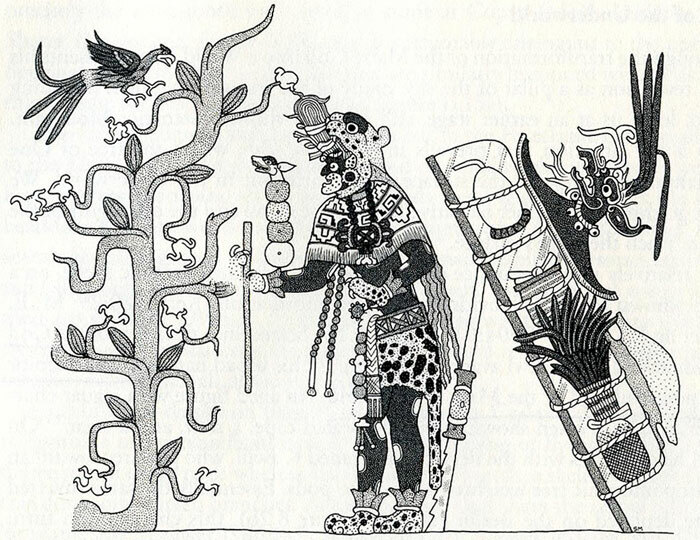 What isn’t shown is how the scene continues up a stairway towards the earth’s surface, where the tree turns into a series of cornstalks on which each cob is the head of the reborn Maize God. Talk about transformation! 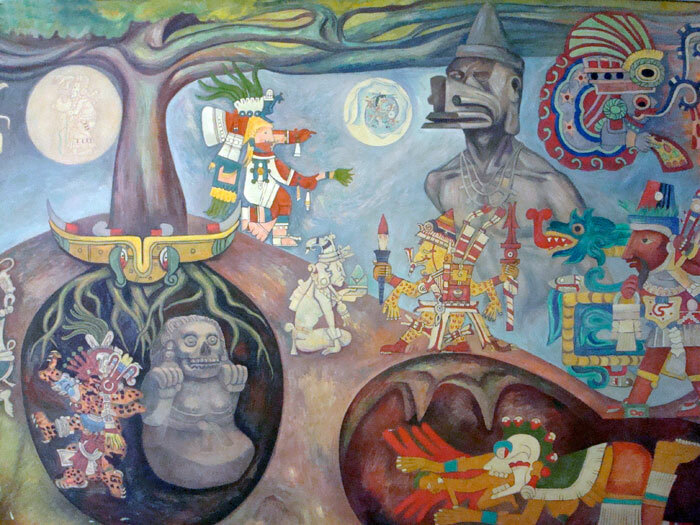 Going back to the palace scene (pic 8) the fiery looking god in the middle has associations with lightning, widely believed in ancient Mexican belief to be the agent that ‘frees’ maize and other seeds from within Nourishment Mountain, by splitting it open. The task of rescuing cacao and all the other foods that will feed human beings falls to the lightning bolt god, whose special power can penetrate different worlds with fearsome energy. 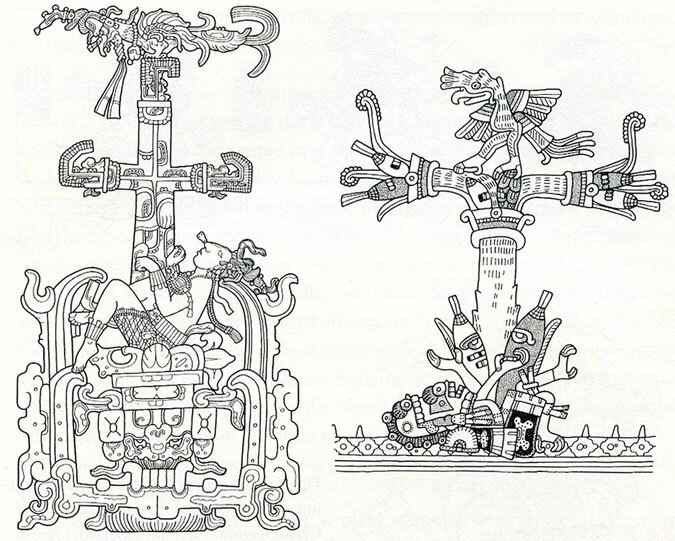 As a result, the Maize God can rise up out of the split earth and be reborn in the form of a World Tree, eventually ascending to the sky – a powerful representation of the creation of humanity, and an end to earthly darkness and chaos. So there was always something extra special, then, in the ritual act of sipping chocolate: for the ancient Maya it was a way of remembering and commemorating the old corn god on his triumphant journey up from the Underworld to the earth, the skies and beyond, a journey of death and life, of rebirth, and in the end of complete union with the cosmos. 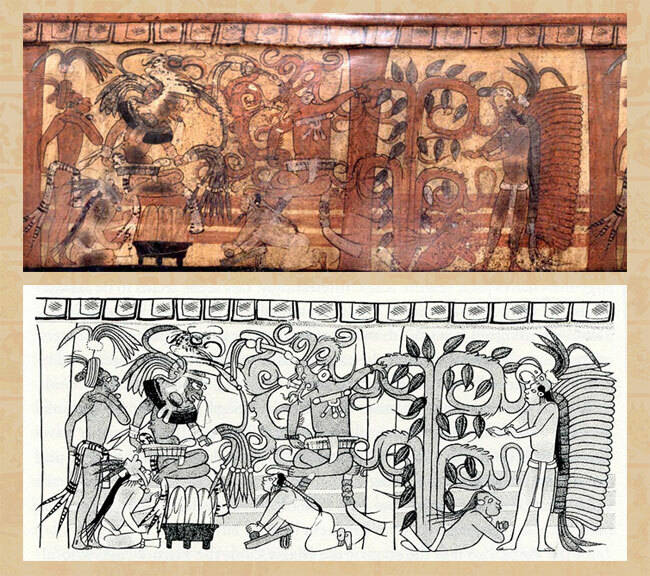 • Pic 7 (right): image adapted and scanned with permission from our own copy of The Codex Borgia: A Full-Color Restoration of the Ancient Mexican Manuscript by Gisele Díaz and Alan Rodgers, Dover Publications, New York, 1993.